I’ve done a lot of painting during the seven years we’ve lived in this house. A lot. Most rooms have been painted three or more times… Adam jokes that there are so many layers of paint on the walls that I’ve actually decreased the square footage of our home. 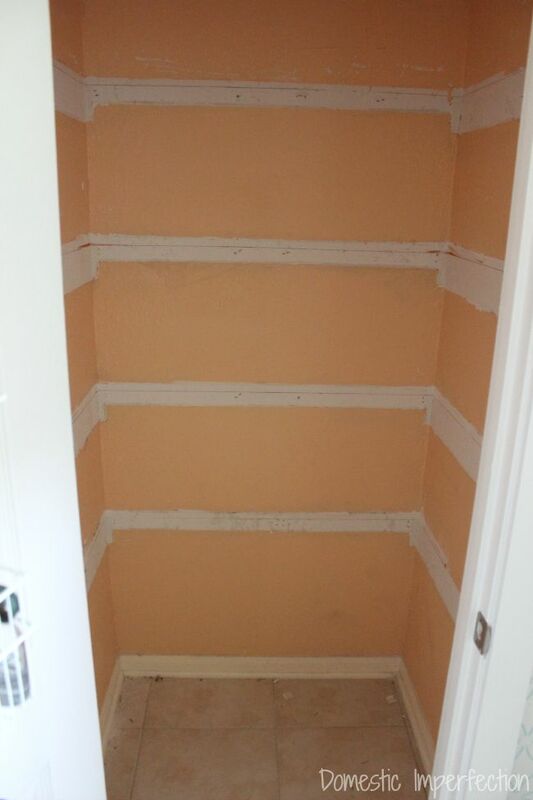 There is one spot that has yet to be caressed by a paintbrush though, the single stronghold that reminds me daily of the time we bought a house that looked like the inside of a stomach. That’s the BEFORE before, like before I got my hands on it. I made it much, much worse. Do I really need to explain why this space needed an update? Basically, I’m a slob and the super deep shelves (and random narrow one at the bottom) weren’t helping. It all had to go. The plan? 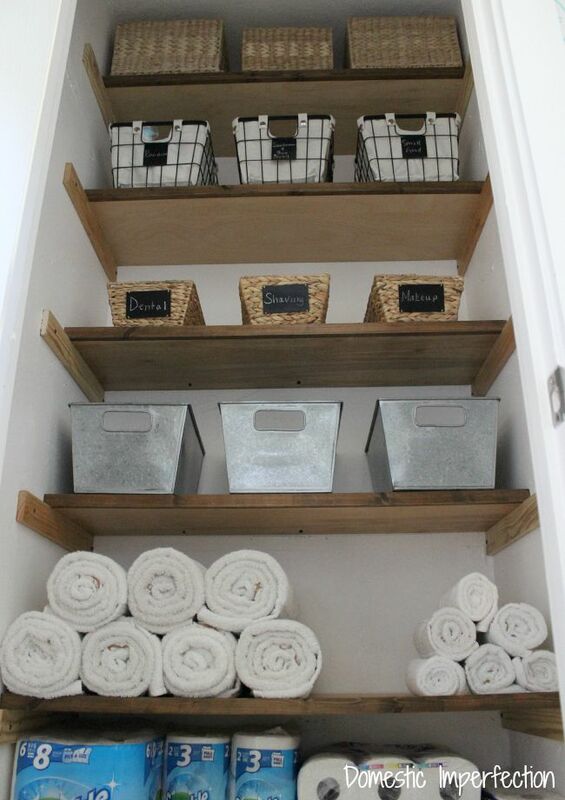 White paint, wood shelves, basket storage. Easy. 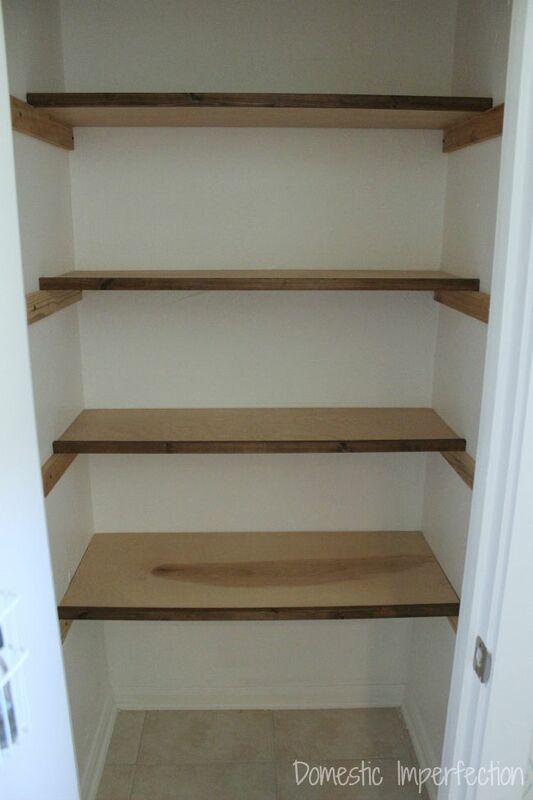 I tackled the closet this last weekend, and asked Adam if he would make some shelves for it. I just wanted them to be wooden, simple, and free (using scraps from the garage) and expected mismatched plywood plopped into supports. 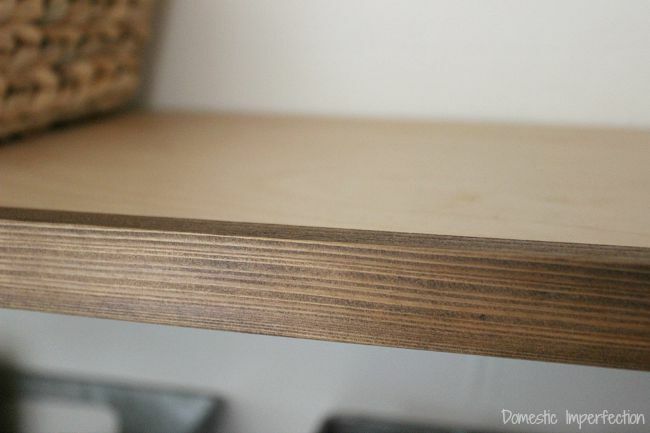 What Adam made was birch shelves with a wood strip across the front (stained to match the other wood in the bathroom), sanded smooth and sealed with poly. 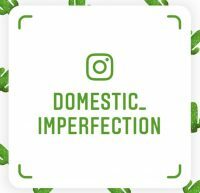 That man….if he wrote a DIY blog it definitely wouldn’t have the word “imperfection” in the title. 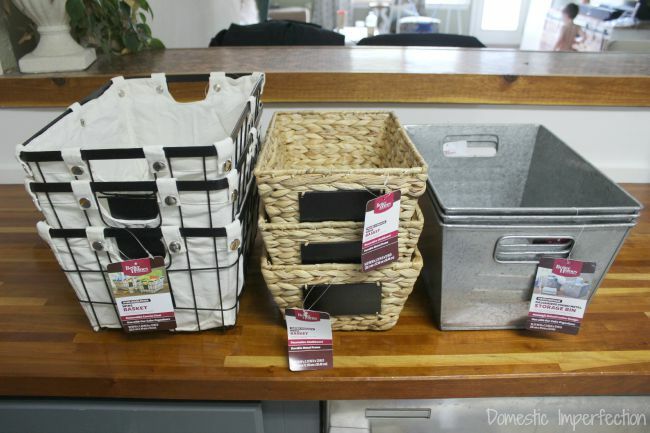 They’re all from BHG at Walmart from right to left is the wire basket, hyacinth media basket, and galvanized bin, each $7-$8. They have a ton of other options too, most of them have the rustic/industrial/farmhouse thing going on. Ahh, isn’t that nice? Although I think I’m going to switch out those small hyacinth baskets out for bigger ones, these are so small that they look kinda ridiculous. So anyway, on the very bottom I have extra toilet paper and paper towels, and on the shelf above that is extra bath towels. I’ve never rolled towels before but figured I might try storing them like this for a while and see if it keeps them in place and not constantly sliding off the shelves. On the shelves above that is bins full of all the extra bathroom supplies. I love baskets and bins because you can basically still be your slob of a self, but instead of hurling stuff randomly onto an already crowded shelf, you hurl it into the labeled basket. It’s the same amount of effort, except one makes you feel like a dirty hoarder and the other makes you feel like you deserve a pat on the back from Martha Stewart herself. 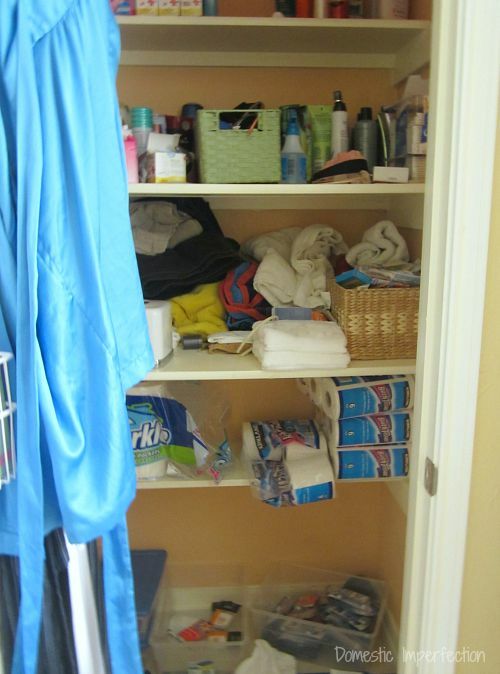 This closet is really just for all the extra bathroom supplies, the things we are currently using are in the vanity. Now that it’s organized and actually looks nice I think I can actually keep it like this (hey, it worked in my pantry!). Thanks Jan! We don’t have a linen closet planned in our new house, I wanted one but there just wasn’t a place. I’ll enjoy it while it lasts (for both of us)! Every home should have an Adam!haha. 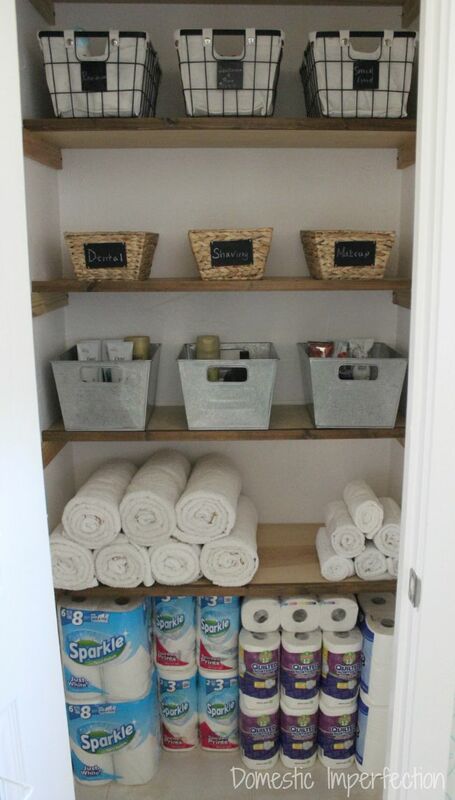 This looks so great all organised, you’ve inspired me to tackle my laundry room asap. Also, I really must get some plain white towels, ours still all have cartoon characters on them, it’s time to grow up I think! 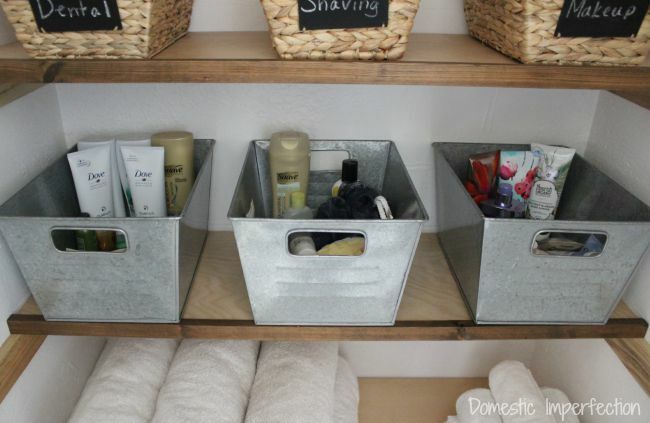 Love the galvanized bins, if only Ireland had walmart!!! ps: love the bonus toddler in the background, small naked people are present in most of my photos at the moment also….intentionally or not! 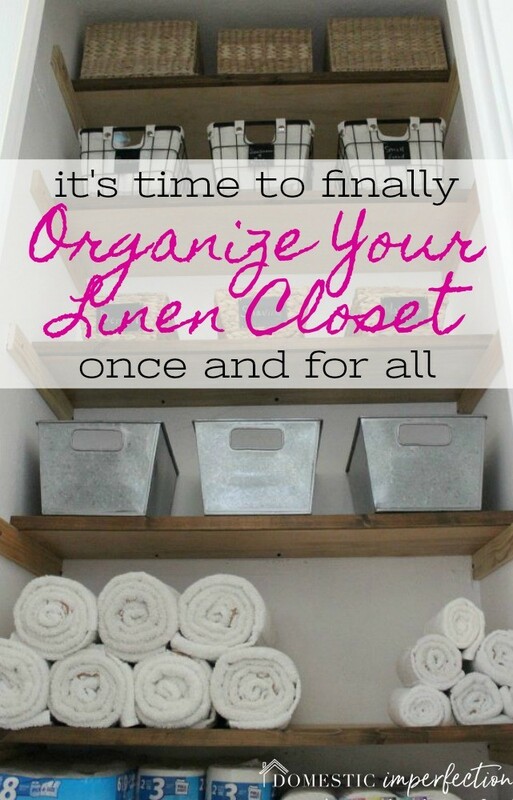 Yes, do your laundry room….it will feel so good to have it done! Funny about the small naked people… I didn’t even notice him back there! I’m surrounded by dudes in their underwear, all day every day. These are they days, right? I love that his blog wouldn’t have “imperfection” in it. hahaha! Looks really nice, I bet it’s a relief to finally be 100% finished with the pink! It is a relief…though I never would have guessed it would have teen me this long! I have so many projects like this, simple little ones that I probably won’t finish until right before we sell. Go figure. Great transformation! 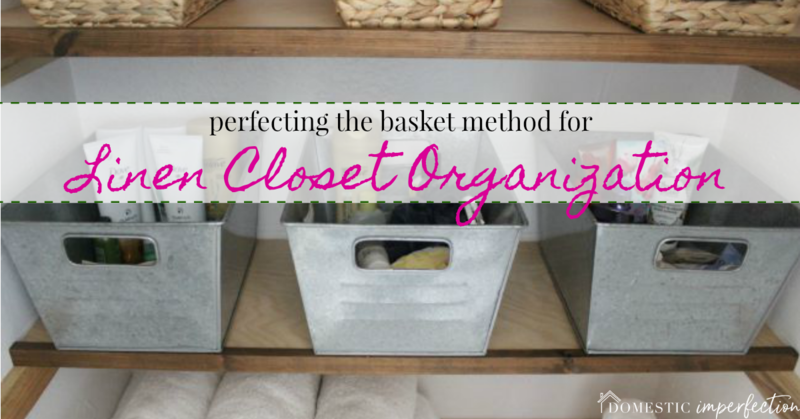 I love using baskets to organize! Love the baskets! They are indeed great for keeping things tidy-looking, and they’ll also be awesome when you sell your house. I remember our realtor telling us when we sold our last place that organization was really important because we weren’t just selling the house, we were selling the idea that if the buyer bought OUR house they could be organized and really have their life together. And we closed in a week for full asking so I guess she was right? We have the WORST Wal-Mart ever! We never have any of the cute, modern stuff that you show on your blog. I’m totally jealous! I bought all these on WalMart.com :) I don’t have a WalMart near my house and they few times I’ve gone I couldn’t find what I was looking for. They have everything online though, and I don’t have to go shopping with my three littles (always appreciated!). 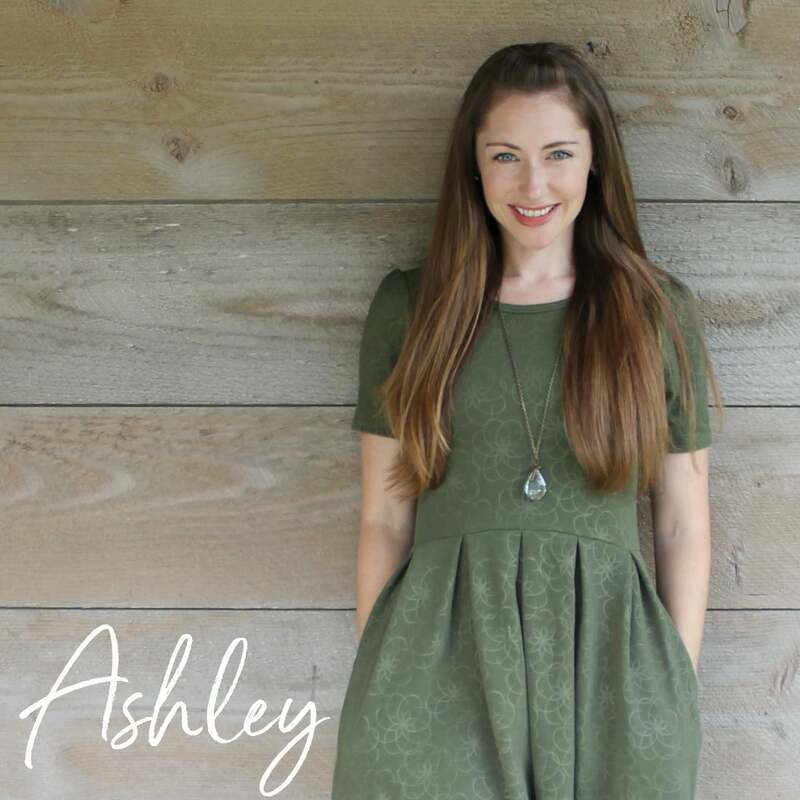 I love shopping online, it definitely beats shopping with the kids in tow, I have three boys also and while I love them DEARLY, I do NOT love shopping with them, lol. I’ve been a reader of your blog for a couple years now and the fact that you coupon just made me so happy! I coupon myself and the struggle is real. 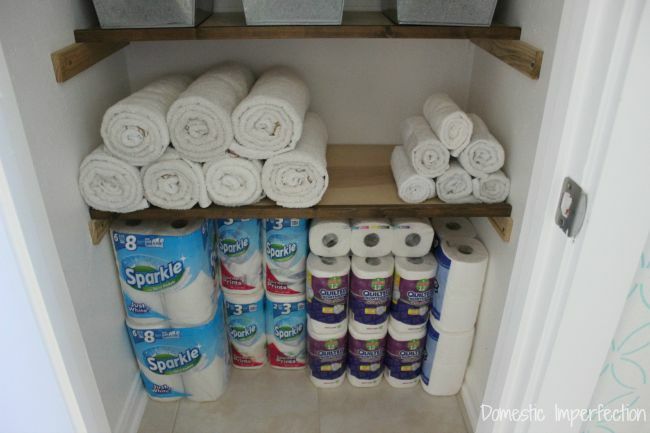 My husband is always so confused when I come home with more paper towels and tp :) Thank you for motivating me to tackle my own slob of a linen closet! The struggle IS real, haha. I used to coupon like crazy before I had kids….I was the lady with the binder that got paid to take stuff. I have so many feminine products leftover tom those days that I’m probably set till menopause. Wire baskets and bins have been an absolute live saver for me! I started this idea with the kids bedrooms and all of their toys, organizing them by what they use the most and then by size. 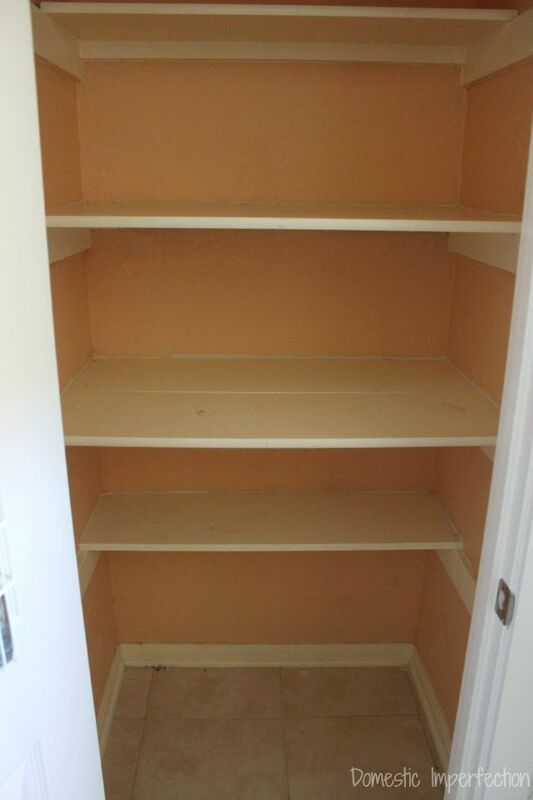 I’ve continued this idea to my own pantry and now it looks as fabulous as your closet! What do you keep on the big baskets on the top shelf? I’m loving this organization and am going to try and implement myself. Well, since you asked…one is full of washcloths and the other two are full of feminine products :) I coupon and they are easy to get for free, so I have a large stash.